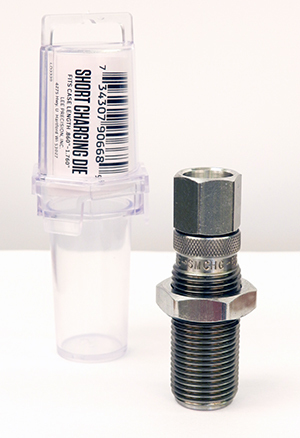 Lee Short Charging Die is for use with the Lee Auto-Disk, Pro Auto-Disk and Auto-Drum Powder Measure. ﻿ Works with cases .860 to 1.760 inches long (22 Hornet to 223 Rem), and bullet diameter .223 and larger due to powder bridging. Works the same as the pistol powder through expanding die, except it doesn't expand the case mouth. Rifle case expansion is done in the sizing die. For cases 1.760 to 2.620 inches long, use the Long Charging Die.